Recently, we examined the comparative efficiency of bottoms-up and top-down businesses. Today, we’ll dig into valuation metrics to see if there’s any systematic bias in the investor community for SMB, Mid-Market and Enterprise SaaS companies. Using public data, I categorized the 50 or so public companies by ACV at IPO. SMB is less than $10k, Mid-Market is between $10k and $100k, and Enterprise is greater than $100k in average customer value. The data indicates that SMB companies trade on average at 8.1x trailing revenues, Mid-Market at 5.9x, and Enterprise companies at 6.5x. The difference between the Mid-Market and SMB figures are statistically significant at an R^2 of 0.09, but none of the other figures are statistically different. 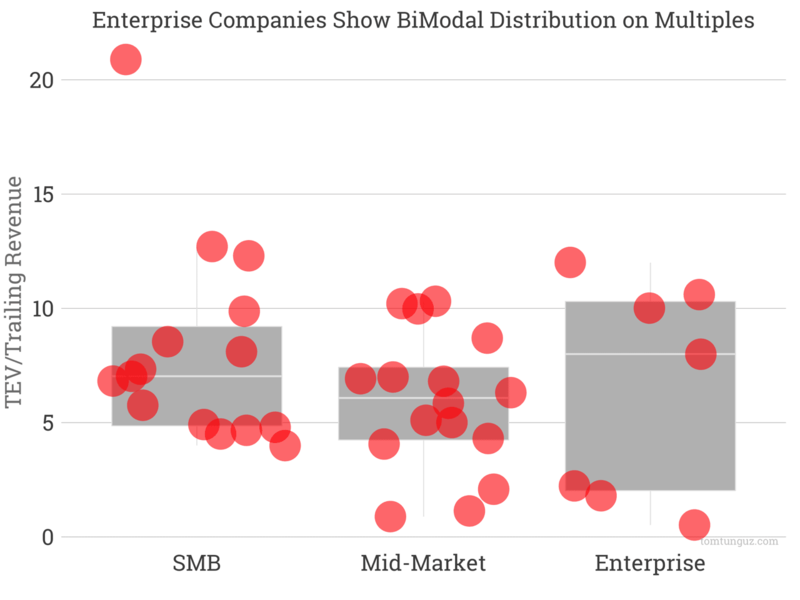 The Enterprise data set includes 9 companies so the sample size isn’t large enough there to overcome an interesting dynamic of the enterprise market: the bi-modal distribution. There are three Enterprise businesses trading at premium multiples of around 10x trailing, but also 3 that trade at below 3x trailing. 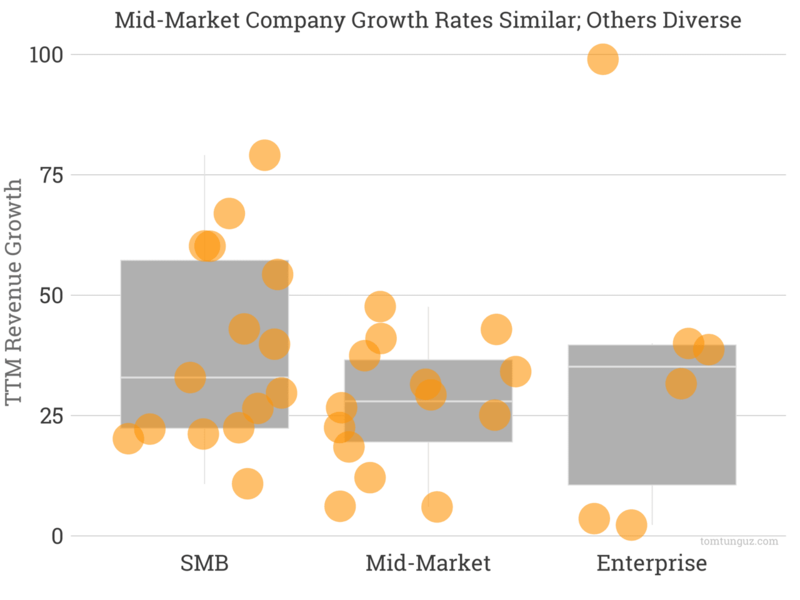 In the SMB and Mid-Market, there’s quite a bit of variance. 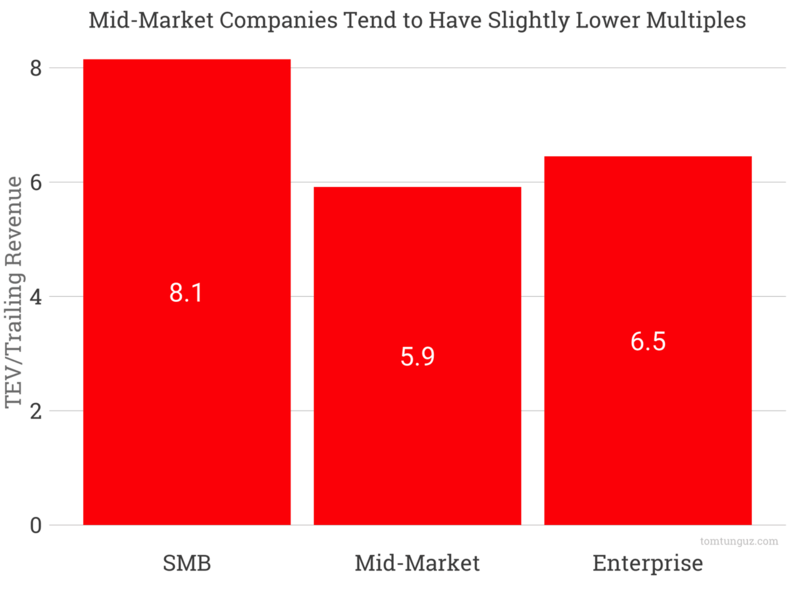 The SMB market multiples more consistently higher than Mid-Market, echoing the first chart. So, are Mid-Market companies consistently considered less valuable businesses? No. 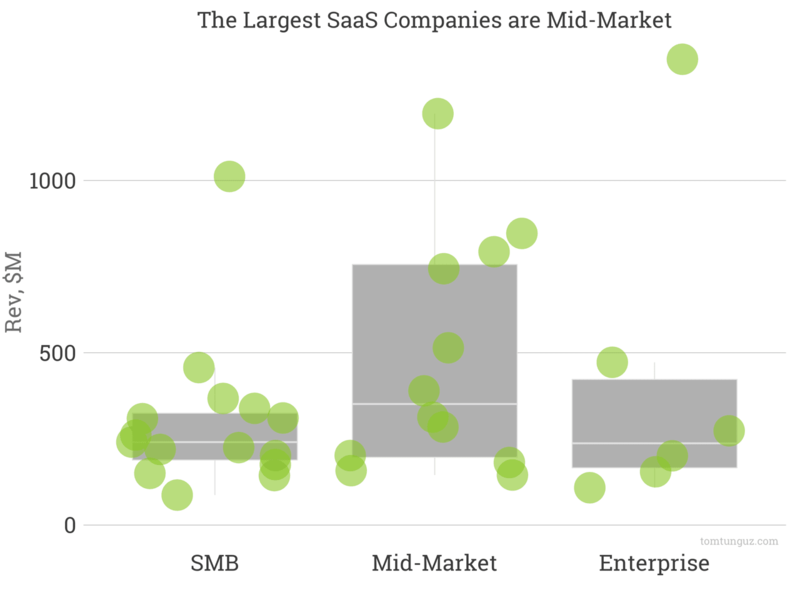 The biggest SaaS companies are Mid-Market companies. The chart above shows the distribution of the sample by revenue, and I’m excluding two of the largest SaaS companies as outliers because they skew the chart. These enormous businesses can’t sustain the same growth rates as their smaller revenue peers in both SMB and Enterprise, and so they receive a slightly smaller multiple. Overall, there is no meaningful difference in valuation by customer size. A SaaS startup at scale is going to be valued by its growth, market size, and long term prospects, irrespective of how many customers of what size it acquires.